← How Do Bridges Work? 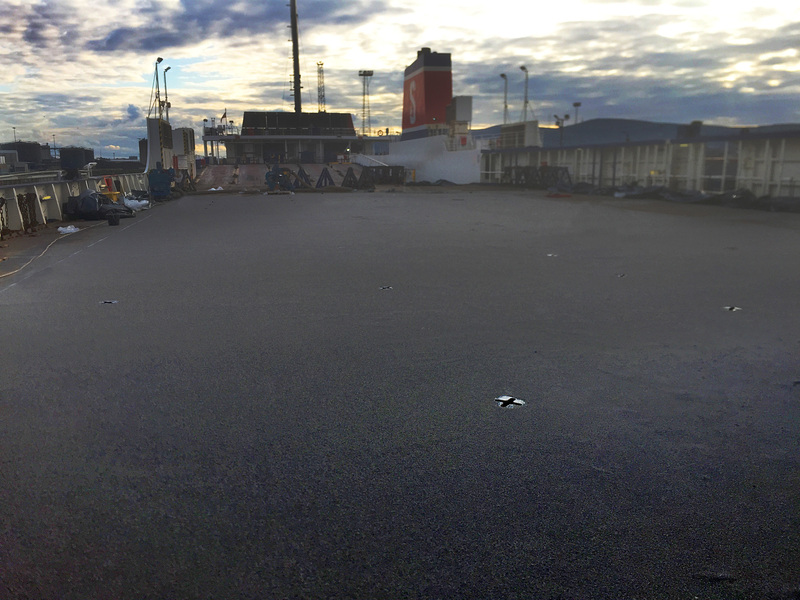 Thortech were to complete the resurfacing of the weather deck, and complete surface repairs to ramps while the vessel was on a layover at Belfast. The timescale for this project was at 2-day intervals over 2 layovers in succession. The surface on the weather deck to be replaced was a paint system which did not possess any anti-slip properties. The most economical and safe solution was to provide a Bimagrip LS waterproofing and anti-slip system. Due to the nature of the trailers turning on the surface, the appropriate bauxite 1>2 mm was chosen as the preferred aggregate. The old paint system was removed by Scarifier, Grinder and Hilti Breaker. With the steel deck then prepared by Enclosed Shot Blasting machines to a SA2.5 standard. The steel was then immediately primed to ensure adhesion to the substrate and avoid contamination with brine and salt. After the primer had desiccated the substrate was then applied with an application of the Bimagrip LS System at the desired spread rate, which was immediately dressed with Guyanese bauxite chosen due to its technical performance with Bimagrip LS. The total area completed was approximately 600m2, and the project was completed with a quick turnaround on schedule and on budget. The freight now continues to work efficiently with daily Ro Ro’s on its new Thortech applied surface. Find out more about our Bridges & Marine surfacing services: http://goo.gl/NWhSr5 View a gallery of images for this project.